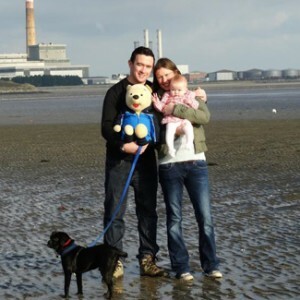 IN August, 2012, Feelgood interviewed Jason Garland, a fire-safety engineer who had a special bond with his cuddly-toy Pooh Bear. The movie, Ted, had been released, and there were parallels. Jason told us about the bear who had travelled the world with him, who had been to Ayres Rock and attended his wedding. The story captured the public imagination and was followed by several radio interviews. Life was good. Jason’s wife, Valerie, was pregnant and he joked that, come the birth, Pooh might be jealous. Sadly, that was not to be. The next day, Pooh had been due to draw the raffle tickets at the Aughrim Teddy Bear’s Picnic. Jason kept Pooh’s Facebook page in Keeva’s memory. “It makes her more real,” he says. 2013 was a difficult year for the couple, who were still grieving for their baby. But then came great news. Valerie was pregnant again, and with twins. But the euphoria was not to last. “Oisín wasn’t growing at the same rate as Saoirse. The doctors didn’t expect him to live later than 16 weeks into the pregnancy. This put Saoirse’s chance of survival in serious doubt. We were on the brink of losing everything. We felt there’d be no coming back from that,” Jason says. Oisín proved to be stronger than expected, and was still alive when Valerie’s waters broke at 30 weeks. On March 31, Oisín’s heart stopped. And on April 4, Valerie had an emergency caesarean section, and the twins were delivered. She was able to hold Oisín, while Saoirse, at 4lb 3oz, was whisked away to the neonatal intensive-care unit. The next few days were bittersweet. “It was a blur. On one hand, you’re delighted that you have a little girl, especially after we had lost so many, but you’re so sad for all the ones you have lost. For the first 10 hours, I couldn’t see Saoirse or hold her. Jason took a video for me, and I watched it over and over again. “They were born at 6.57, on Friday night; the nurses said I could see Saoirse at five o’clock the next morning. I was wheeled there on the dot. I’ll never forget seeing her little face. Now 10 months old, Saoirse is a gorgeous, blue-eyed happy bundle, and she’s thriving. She’s been joined by a puppy, called Declan, a very sweet King Charles Pug cross, and she, Declan, and Pooh are the greatest of friends. “Pooh comes to the park with us, and on holidays, of course. It doesn’t look so odd now,” quips Valerie. Pooh is also to star in a short film later this year. During Valerie’s time in hospital, the couple had an afternoon out. It was Mother’s Day and they wandered around Merrion Square. Jason wanted to do something in Oisín’s memory. “I needed a hug back then. And I thought, ‘what if there was a Hugagram service, where people could log on and order a hug for loved-ones? Currently available in Dublin, a hug costs €50, including VAT and a €5 donation to the LauraLynn Children’s Hospice. Published in The Irish Examiner, 13th February. 2013.